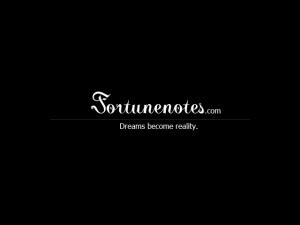 Fortunenotes is a website which lets you share your dreams and achievements. 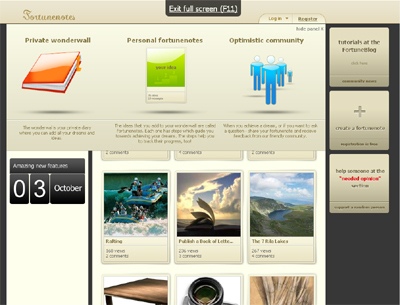 Members create a private wonderwall which lets them track their goals, and when ready share them with others on the network. It doesn’t matter what you aim for (new house, trip to China, office prank for your boss), you can post it at the network and show it off to others. The shared dreams or as we call them fortunenotes, act as an challenge towards other members. Ideally sharing a goal on the network could lead to a chain reaction, where members achieve your idea at various places around the globe and in different ways. This brings great motivation and inspiration to our members, and most of all, adds excitement and fun to our lives. We are the only website which offers member share their experiences and participate into other people’s dreams and ideas. We are more than a diary that you just write notes in, we also offer you the feature to track your progress, but most of all we have a unique social element!